Old Smokey comes in and old style glass jar with a cork enclosure filled with 4.1 ounces of smoky goodness. Old Smoky takes your taste buds on a rustic adventure through scenes of log cabins, cattle drives, mountains and campfires. Where smoke and the smell of food fill the air bringing you a sense of comfort and joy. This blend of 19 herbs and spices gives your food a perfect balance of smoky and flavor, bringing each bite that rustic adventure. 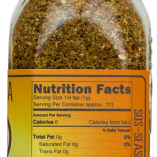 Great with all steak, fish, chicken, vegetables, pork, eggs or anything you want to add a great smoky flavor to. Old Smokey is Always Fresh, Non-GMO, Gluten Free, No MSG, All Natural, Paleo and Low in Sodium. 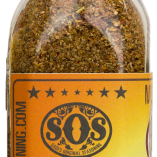 Good Food Deserves Great Seasoning!